Here’s a recipe that is sure to be a hit at any party, friend’s gathering, kid’s get together, or just for a great snack – Foreman Grill pretzel bun sliders. Let’s face it – everyone loves sliders. They’re little hamburgers with BIG taste and are just, well, fun to eat. 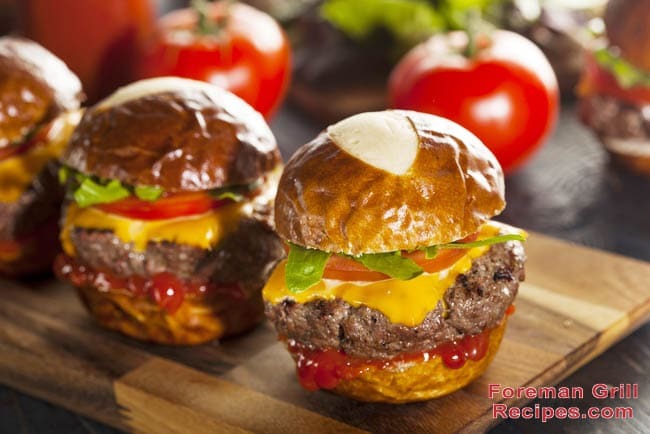 There are any number of ways to prepare great sliders and this recipe will show you how to make amazing sliders on your George Foreman Grill. Really, this is the perfect way for making sliders. You can make a bunch at once, it’s super easy to do, saves a ton of time, and they come out absolutely delicious. So if you’re looking for an idea for you next party or potluck, be the hit of the event with these pretzel bun sliders. Start by finely chopping 1/2 an onion. Yellow onion will work fine but red or white is fine too. While you’re doing this, preheat your George Foreman Grill for at least 5 minutes with the lid closed. When grill is hot, put chopped onion on the grill and close lid. Let grill for about 3 minutes. Onions should be translucent and soft. Carefully remove onions from grill and let cool for a minute. Serve on the pretzel rolls with pickle slices and whatever condiments you like. A little dijon mustard is absolutely amazing on these pretzel bun sliders!